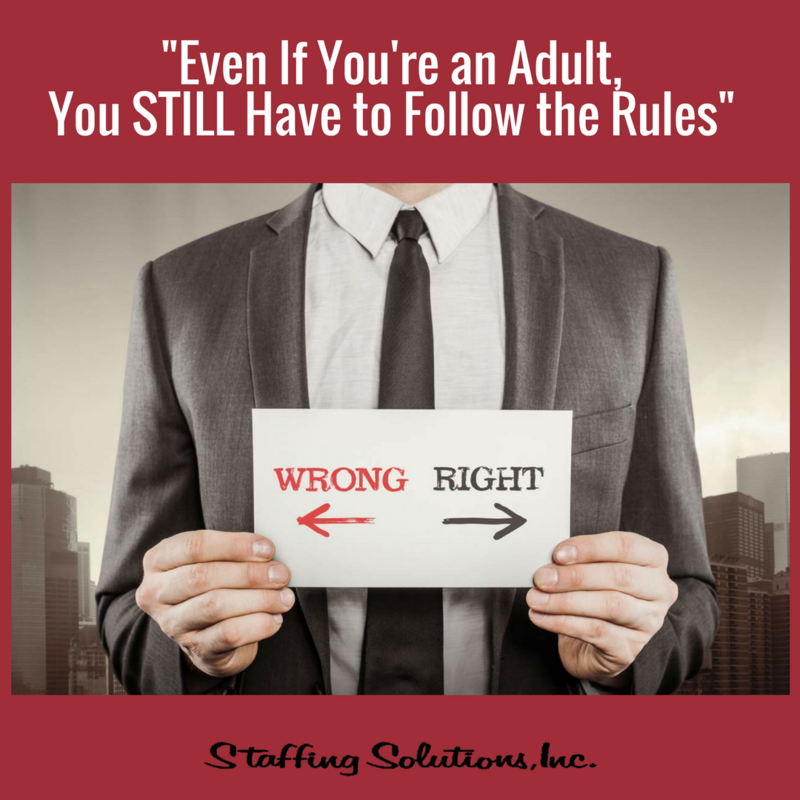 “Even If You’re an Adult, You STILL Have to Follow the Rules!” - Staffing Solutions, Inc.
What happens when we don’t follow the rules? When we don’t follow the rules, there are always consequences… And they can range from being minimal to something as extreme as a career snafu. We recently had a situation play out that represents this so-called “career snafu”. We had just placed a candidate in a contract role that she was a perfect fit for. A few weeks passed, a check in was conducted, and everything seemed to be in place. Shortly after, her boss emailed to inform us that he had offered her a Full-time position, which she had accepted, and would be starting the next day. As a staffing agency, this is something we are always over the moon about! Unfortunately, our candidate and client did not follow our protocol, which is: If you are offered a position, to contact our office. The candidate had verbally accepted the position without an offer letter, meaning she knew nothing about what her benefits and PTO package would be. Because she may have felt caught off guard, she also accepted the job at a salary below what she was seeking. After requesting an offer letter, her new employer had dictated she write it herself, which is where we, and she, realized that the company did not offer any health care benefits. So here we have a candidate who is now being paid less than what her salary expectations were. Fortunately, she was able to move to her husband’s health care plan, but at a cost. We hope that she doesn’t become angry with herself, or that this affects her self-esteem. She also was promised an increase in 6 months, but we all know that a promise in the workplace is no good until it’s written on a contract. This situation is exactly why our Employee Handbook requires that our contractors contact us when they are offered a position. Rules, like these, are in place for a reason. If the candidate would have followed protocol, we would have gone to bat for her and likely negotiated a package that met her financial and personal needs. Through this example, you can see how important it is to follow the rules you are given, and how doing the opposite can turn what should have been a positive situation into a disappointing one. Bottom line: Your parents (sorry) were right!